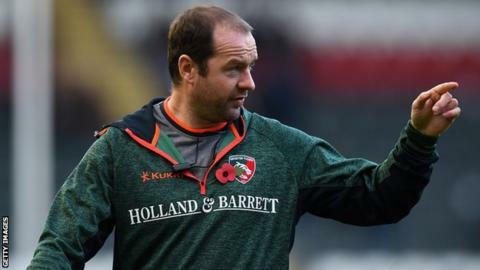 Cardiff Blues have held talks with Leicester assistant Geordan Murphy over the vacant head coach's job at Cardiff Arms Park. Ex-Ireland international Murphy is one of several potential candidates to replace Danny Wilson in May 2018. Murphy, who played 72 times for his country, has been Tigers assistant since retiring from playing in 2013. It is understood Murphy was on a shortlist of three for the post and no appointment has yet been made. There were 28 applicants to replace Danny Wilson, including a number of former international coaches. However, an announcement expected by the end of November has yet to materialise. Murphy spent his playing career with Leicester, playing 316 games in nearly 16 years at the club. In addition to his Ireland career Murphy played two Tests for the British and Irish Lions in 2005 - one against Argentina in Cardiff and the other against the New Zealand. Wilson joined the Blues in 2015 following spells with Bristol, Scarlets, Dragons and Wales Under-20s.